A small thick cut of meat from the front or hind leg of a pig directly above the foot. It’s usually sold bone in, is gelatinous with much skin, tendons and ligaments. It is excellent for stewing or braising and is available fresh, smoked or cured. It may also be referred to as a shank cut. 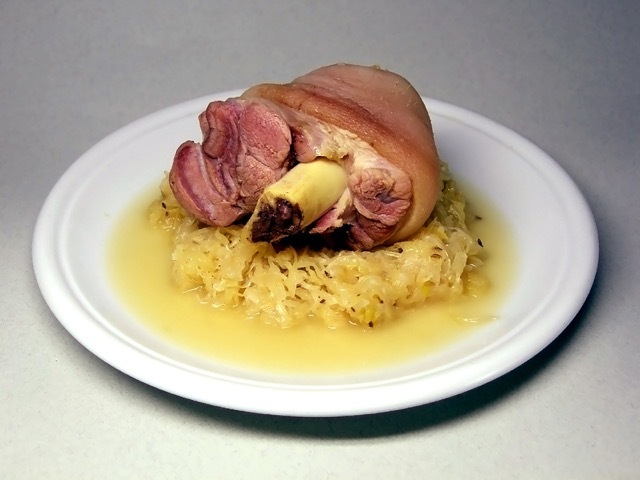 Ham hocks add a distinctive flavour to food. They are best cooked with greens and vegetables (collard greens, mustard green, cabbage, endive) or pulses (beans, navy bean, lentils). They can be added to soups and sauces (Peas soup). Prev What is all-purpose flour? me too! totally filling and warming too! While I know when I slowly cook a ham hock I should leave it for the soup, I’m always tempted to rip and tear at it as soon as I can to eat the salty tender goodness of the meat off the bone. It’s so good when it falls off the bone. I know exactly what you mean!